UNC-Chapel Hill seniors Sarah Khan and Madhu Jayaraman (left and right) pose with their outgoing chancellor, Carol Folt, at a farewell party on Tuesday organized by Folt's office. Folt resigned earlier this month in the same email she ordered the remaining pieces of Silent Sam be removed. Lisa Philip reports on a farewell for UNC- CH Chancellor Carol Folt and how students are feeling about her departure this week. 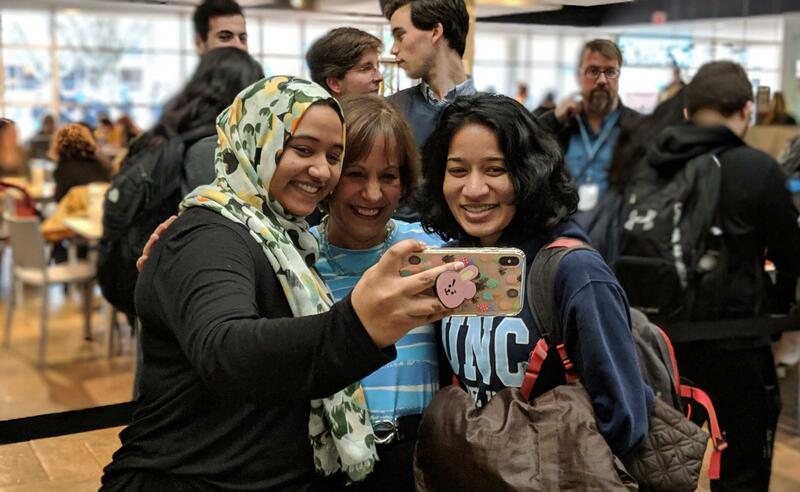 Dozens of UNC-Chapel Hill students gathered at the Carolina Union yesterday to say goodbye to Chancellor Carol Folt, who steps down tomorrow. “She’s like known for her selfies and whatnot, so I want to do it one last time,” said student Sarah Kahn, as she waited in line with a friend for a free slice of pizza -- and the chance to take a selfie with her outgoing chancellor. Folt announced her resignation earlier this month, in the same email she authorized the remaining pieces of Silent Sam be removed. Folt had been criticized for both her action and inaction with regards to the Confederate statue. But Khan, a senior, said she’s always liked how approachable Folt seems. “I’m sad she’s leaving so early and that she won’t be here when I graduate, or give my commencement speech,” Khan said. Folt had planned to stick around until seniors graduate in May. But hours after Silent Sam’s base was carted away from campus on her orders, the Board of Governors said she needed to be gone on Jan. 31. The board's chair denied the move was retaliatory. But UNC junior Greg Davis doesn't believe that. That’s why he has mixed feelings about the chancellor's departure. Davis said he’s heard a lot of people criticize Folt for not taking action on Silent Sam, until she announced her resignation. “I was like, 'Shoot, I would’ve done the same thing, I ain’t gonna lie to you, you know',” he said. 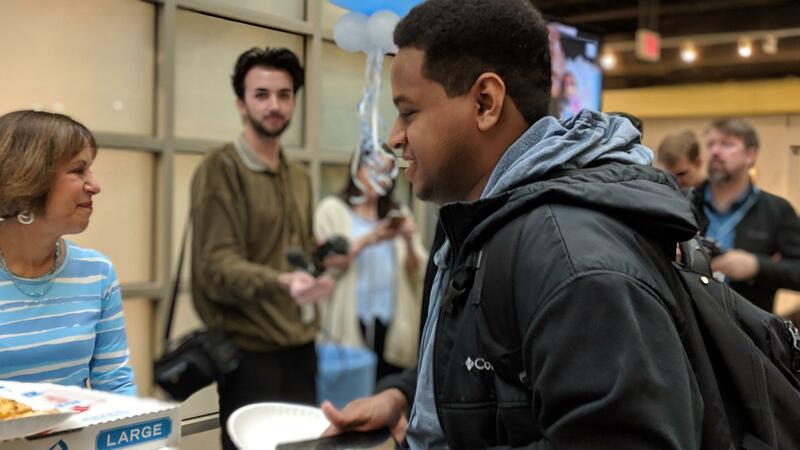 The circumstances surrounding Folt’s departure have some UNC students, like senior Yohanns Tedla, nervous about a new chancellor. He had just gotten through the Folt farewell line, and was signing a thank you card. UNC-Chapel Hill senior Yohanns Tedla grabs a slice of pizza after chatting with Chancellor Carol Folt at her farewell party on Tuesday. Folt steps down Thursday, as ordered by the UNC system Board of Governors; Folt had planned to continue on until spring commencement. “I don’t feel so high about it, because they’re taking her out because she did something they didn’t like, so they’re probably going to try to pick someone they do like,” Tedla said. The UNC system's new interim president, Bill Roper, has been tasked with appointing Folt’s immediate successor. He is expected to meet today with faculty leaders about the selection process. Despite a second long, closed-door meeting in the span of a few days, the University of North Carolina Board of Trustees has yet to announce the selection of an interim chancellor. The University of North Carolina's Board of Governors on Tuesday voted to make UNC Chapel Hill Chancellor Carol Folt's resignation effective Jan. 31. She had planned on stepping down after spring graduation.